Enhance your creativity and develop critical thinking skills through the study and critique of literature. You'll learn from UMC's award-winning faculty, who serve as mentors as well as instructors. The many study abroad opportunities at UMC help make cultures come alive. Read, write about, and discuss classic literature. As language, reading, writing, and communication change and adapt to the features of an increasingly technologically based society, the importance of and demand for reading and writing skills increases. The University of Minnesota Crookston (UMC) is an applied learning campus, and, as such, our English degree is created to meet the needs of an ever-growing career market. The B.S. in English at UMC combines both writing skills, to ensure a mastery of the applied skills vital to most employers, as well as the critical study of world literature, to strengthen one's value of multiculturalism and creativity. English majors demonstrate proficiencies in the intensive writing processes through invention, organization, drafting, revision, and editing for personal and professional writing. English majors read books, plays, poems, and short stories from around the world and hold course discussions on key concepts within the literature, the era, and the theory surrounding the work. Innovative thinking is an asset to any profession, and an English degree encourages creative thinking in its critical analysis of world literature and in the writing process. A degree in English addresses the importance of diversity. The study of English gives students insight into world cultures and their means of expression throughout history and helps to make students world citizens. Online students are encouraged to study abroad by taking GnEd 3000 - Global Seminar. This experience counts towards the English major or minor. The English program requirement of a minor or double major allows students to further focus their professional career preparation. The 40-credit English major makes this possible. For example, a double major in English and Entrepreneurship, or a double major in English and International Business will enhance your career prospects. Additionally, a minor in English is an asset to any major. Employers are actively looking for the writing and critical thinking skills that English studies offer. As language, reading, writing, and communication change and adapt to the features of an increasingly technologically based society, the importance of and demand for reading and writing skills increases. 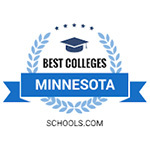 The University of Minnesota Crookston (UMC) is an applied learning campus, and, as such, our English degree is created to meet the needs of an ever-growing career market. The B.S. in English at UMC combines both writing skills, to ensure a mastery of the applied skills vital to most employers, as well as the critical study of world literature, to strengthen one’s value of multiculturalism and creativity. An English major also prepares you for graduate school. Interested in double majoring? See how English stacks up with other majors!